A young poet walks onto the hardwood floor of an illuminated stage. She positions herself within the bright orb of a theatrical flood light. A heavy and deep red velvet curtain provides the backdrop and frames her and a single microphone. She takes a moment, breathes inaudibly and assesses the audience with an even gaze. It is a packed house and the expectant faces look back at her, hushed with anticipation. Her first words are not poetry, rather an introduction of her clans spoken in Diné. Her voice is strong and clear. “Kya” is Navajo, seventeen years old and loves to write. She struggles to balance home life and school work. On most days she is a vibrant, smiling student, who likes to doodle on her hands with a ballpoint pen. On other days, she is withdrawn, lethargic and unsmiling. On these days she is quiet and not willing to share in class. Nonetheless, she continues to scrawl verses of poetry in her tattered, beloved journal that she carries everywhere she goes. As her poetry teacher and mentor at the Native American Community Academy (NACA) and an educator for the last eighteen years, I observe and understand that Kya will have good days and bad days. This is very much like a good portion of the students I have worked with in almost the two decades I have taught in middle schools, high schools, summer programs, and even in detention center charter schools across New Mexico. The bottom line I have always found, is that reading, writing and performing poetry engages students to work through familial, communal, social, and emotional issues. Reading original poetry aloud in class can foster trust and empathy in the classroom community, while also emphasizing speaking and listening skills. And it is always of the utmost importance to honor student culture and language while doing so. This is especially imperative for Indigenous youth and students of color. It is my responsibility as an educator to provide robust and culturally-relevant and specific curriculum for my students; curriculum that is not only rigorous, but also framed through the lens of social and emotional wellness. This means that in the classroom, we must honor the vast and heterogeneous cultural histories, traditional practices and contemporary, intersectional identities of Indigenous and POC peoples across Turtle Island and beyond. Our poetry and classroom texts must reflect the young people sitting in the desks looking back at us, and not just the prescribed Western canonized works of a select few. Additionally, it is then that we educators will find ourselves contextualizing social and emotional learning through a strength-based approach that celebrates students and where they come from, as well as where they plan to go. Poetry and the act of performing — sharing your stories with others — can work to cultivate a strong positive cultural identity for young people that is, in turn, ultimately consistent with academic achievement. Harjo celebrates the word as a living and organic organism. It is a legacy of our ancestors and we are the honored descendants. Kya understands this. She says her medicine is administered through writing free verse and she code-switches fluidly between Diné and English in her poems. When she is anxious she writes about it. When she is depressed or experiencing a conflict with a peer, she writes about it. When she is angry or frustrated with the world, she writes about it. Like Harjo, Kya knows that every emotion, too, is need of a poem. Kya writes about a lot of different topics. She writes of baby sisters and little brothers, Changing Woman, best friends, the continued epidemic of missing and murdered Native women, pow wows and her favorite punk rock bands. Kya has become well-aware that her knack and love for writing poetry and storytelling is a powerful medicine that promotes self-care, health and emotional wellness. It is also a platform for her to opine on the ways she perceives the injustices and inequities of the world. It is a platform to be heard and to hear others. At NACA, representing over 65 plus tribal affiliations among our student population, it is our mission to engage students, educators, families, and community in creating a school that will prepare our students to grow from adolescence to adulthood and begin strengthening communities by developing strong leaders who are academically prepared, secure in their identity and healthy. It is the language of our vision and mission that informs the DNA of our school culture. The NACA community and experience will help students incorporate wellness and healthy life practices, community service and an appreciation of cultural diversity into their lives. Our best practices of social and emotional learning start with the fundamentals of honoring where we come from. Essentially, it is a holistic and traditional circle of understanding ourselves in relation to our origin stories, relatives, and the world around us. Social and emotional wellness is one in the same with our NACA personal wellness wheel, a visual tool that helps to guide our students in representing our core values of culture, community, responsibility, respect, reflection and perseverance. It is also a framework for our curriculum design across content and grade levels. Our wellness wheel is centered in a respect for Indigenous knowledge, thus a respect for our young students of our school. The merits of spoken word poetry are plenty. Students are prompted to write about their own experiences, to imagine a world where physics need not to be applied; break barriers of imagination using imagery, hyperbole, alliteration, and even lyricism. Students write about celebration of self and of hardships endured. The act of writing with others in the room creates an immediate bond between peers. The act of sharing it aloud deepens it further. Poetry and spoken word align themselves with a standards and benchmarks, a plus for teachers, but also in its own way is completely unbridled and uncensored. 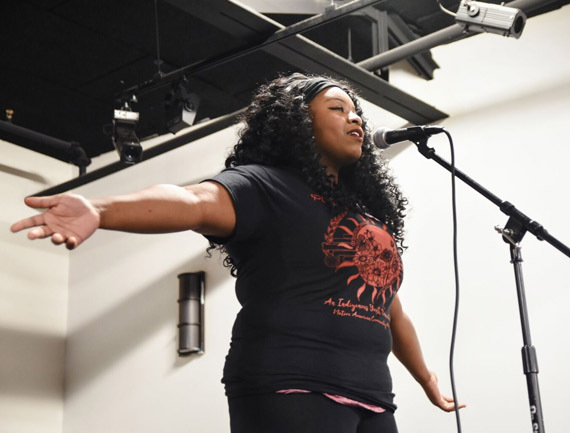 Writing and performing original poetry is a transformative event for young people, in which they take ownership of their own learning, as well as the stories that connect all of us. been asked if my people are even alive. I read this article and found it very interesting, thought it might be something for you. The article is called Spoken Word Poetry as Medicine: A SEL Practice of Celebration and Identity for Indigenous and POC Youth and is located at http://selforteachers.org/spoken-word-poetry-medicine-sel-practice-celebration-identity-indigenous-poc-youth/.